Scientists for the first time have created animals with dinosaur features using fossils as a guide. They have transformed chicken beaks into something similar to a dinosaur snout. Many have pondered the idea of recreating dinosaurs while novelists and sci-fi film directors tempted our imagination with such as creations the Jurassic park film and novel series. A research team led by Yale paleontologist and developmental biologist Bhart-Anjan S. Bhullar and Harvard developmental biologist Arhat Abzhanov, have conducted a successful experiment which allowed them to create chickens with dinosaur-like features. They published their discoveries in a study in the journal “Evolution” on Tuesday. 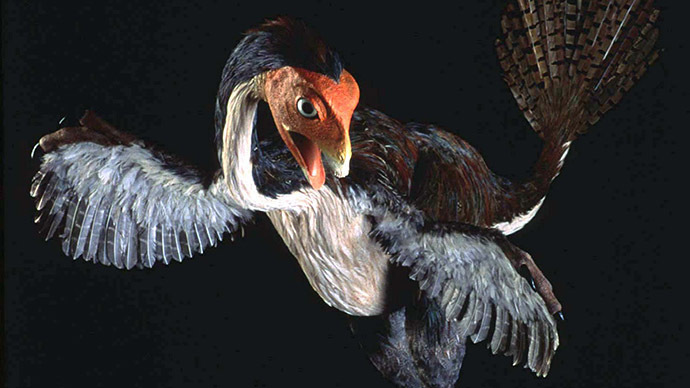 Researchers were able to transform chicken embryos in a laboratory into specimens with a snout and palate configuration similar to that of small dinosaurs such as Velociraptor and Archaeopteryx, according to a Yale press-release published on Tuesday. “Our goal here was to understand the molecular underpinnings of an important evolutionary transition, not to create a ‘dino-chicken’ simply for the sake of it,” said Bhullar, lead author of the study. Thought, the embryos were humanely euthanized after the experiment, Bhullar told MailOnline that in the future it may be possible to allow them to grow into animals with dinosaur features. Why did scientists decide to transform the beak? According to them, it’s one of parts of avian anatomy that has not been changed much in the evolution process. “The beak is a crucial part of the avian feeding apparatus, and is the component of the avian skeleton that has perhaps diversified most extensively and most radically – consider flamingos, parrots, hawks, pelicans, and hummingbirds, among others,” Bhullar said. The research team also found that major living lineages of birds have a unique, median gene expression zone of two different facial development genes early in embryonic development, which the non-beaked creatures lack. When they blocked this gene expression not only did the beak structure revert into a snout, but the process also caused the palatine bone on the roof of the mouth to go back to a dinosaur-like state. “This was unexpected and demonstrates the way in which a single, simple developmental mechanism can have wide-ranging and unexpected effects,” Bhullar said. In 2009 Jack Horner, a paleontologist at Montana State University, proposed in his book ways of“How to Build a Dinosaur” to reactivate the DNA found in chickens, dinosaur ancestors, to recreate a small predator. According to New York Times, he was very excited to know that this experiment succeeded calling it “fantastic”.